The fighting across the Syrian border in northern Lebanon’s seaport city is between pro-Assad militiamen in the predominantly Alawite stronghold of Jabal Mohsen and Bab al-Tebbaneh, an overwhelmingly Sunnite and anti-Assad area. 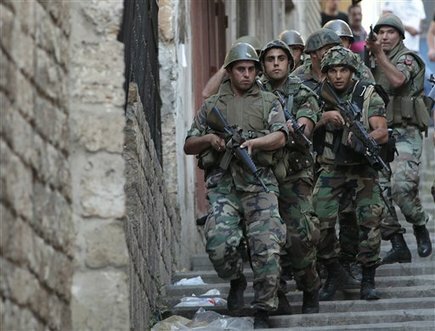 An-Nahar says Lebanese Army units and Internal Security Forces are struggling to deploy in the two areas. It quotes unnamed sources as saying the city has become “a regional pawn.” Syria and its allies are manipulating the pawn through exploitation of a “security hotbed,” which is Jabal Mohsen, to pressure Lebanese, Arab and regional parties. Repeated talk in Jabal Mohsen about inviting the Syrian army back to Lebanon clearly identifies the regional side seeking to revive civil strife in Tripoli and destabilize the country. A counterpunch comes from Jabal Mohsen chieftain Rifaat Eid, who tells the Beirut daily ad-Diyar there are “no Syrian refugees” in Lebanon, simply “Syrian terrorists” and that “the military arm of the Future Movement,” which opposes Assad, is now under the command of the Free Syrian Army. Also on Saturday, Syria troubleshooter Annan warned of the growing sectarian violence in Syria, saying the conflict is already having serious consequences in the region and calling on the international community to work together to push for the implementation of his six-point peace plan. "The specter of all-out civil war, with a worrying sectarian dimension, grows by the day," Annan told the Arab Ministerial Committee on Syria in Doha. "The crisis is having regional spillover, in the form of tensions and incidents across the border, abductions of nationals and foreigners, and refugee flows to neighboring states." Annan stressed that during his meeting with Assad in Damascus earlier this week, he urged him to act immediately to implement the six-point plan, and to honor his commitment to withdraw heavy weapons from populated areas and cease all violence. "The situation is complex, and it takes everyone involved in the crisis to act responsibly if the violence is to stop. But the first responsibility lies with the Syrian Government, and with President Assad," Annan said. "He must release detainees, fully open up to international humanitarian assistance, and allow people to express their views freely in peaceful protest. This is essential to demonstrate his seriousness to the Syrian people and the international community." Annan emphasized the importance of the international community acting in unity to be able to put pressure on Damascus and all other parties to the conflict to stop the violence, and prevent it from spreading further. "Let me appeal to all of you to engage earnestly and seriously with all other stakeholders, mindful that if regional and international divisions play out in Syria, the Syrian people and the region – your region – will pay the price," Annan said. "The time is coming, if it is not already here, for a serious review. The international community must decide what it does next. “From my consultations with many actors, I sense a clear recognition that things cannot continue as they are. I agree. The international community must work together more effectively to push for implementation of the six-point plan in full. We must think this through and we must get it right," he added. 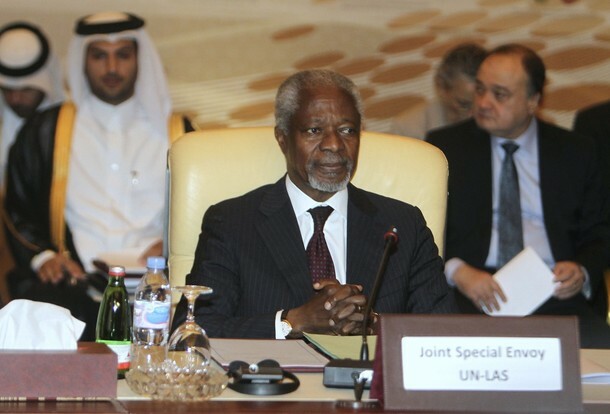 Annan travels to New York to brief the General Assembly and the Security Council next Thursday. Shortly after Annan addressed the Arab Ministerial Committee on Syria in Doha, the Arab League Council of Ministers issued a statement demanding stronger UN measures against the Syrian regime to secure its full implementation of Annan’s plan within a “set timeframe,” including non-military action provided for by Chapter VII of the UN Charter. The statement was referring to Chapter VII Article 41 of the Charter that allows the Security Council to impose sanctions to enforce compliance with its decision. The Arab League foreign ministers also called on network providers ArabSat and NileSat to cut out state-run and private Syrian channels. Algeria, Iraq and Lebanon voiced reservations about the statement in full or in part. One political analyst who is annoyed by Annan’s downbeat report to the Arab Ministerial Committee on Syria in Doha is Tariq Alhomayed, who is editor-in-chief of the leading Saudi daily Asharq Alawsat. After his last meeting with Assad, Annan told reporters in Beirut it was the role of the Security Council to consider other ways forward in Syria. “I know we are all impatient; we are all frustrated by the violence, by the killings. So am I. I think I am probably more frustrated than any of you because I am in the thick of things and would really want to see things move much faster than it has done,” he declared. Annan, in other words, does not want to personally avow the failure of his mission. He is trying to toss the hot potato into the lap of the Security Council, which is already shackled to the wall by Russia and China. Meantime, U.S. Secretary of State Hillary Clinton yesterday called her Russian counterpart Sergei Lavrov to discuss the situation in Syria. A State Department official said Clinton's message to Lavrov was: "We’ve got to start working together to help the Syrians with Syria's political transition strategy. U.S. and Russian officials should engage diplomatically to come up with ideas in Moscow, Washington, New York and wherever we need to."